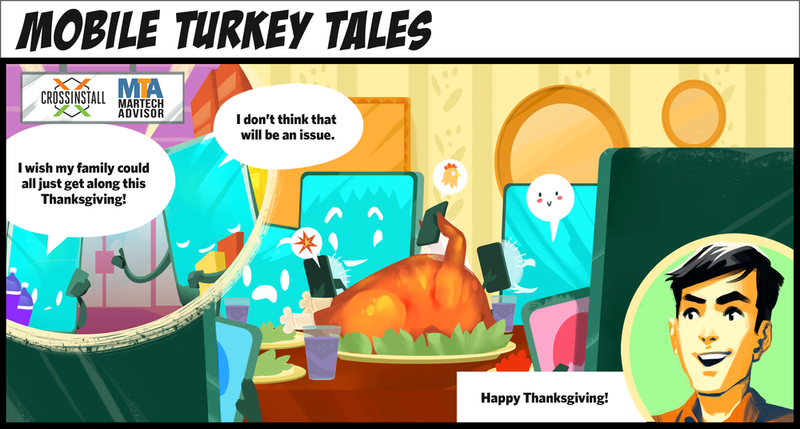 You can also find Mobile Turkey Tales in Martech Advisor. So you want to incorporate your mobile devices into the holidays in a happy and healthy way? Here are three quick tips for family-friendly phone fun - from the phones themselves. We can all relate to being overwhelmed during those crazy family times during the holidays when relatives are throwing insults (or even mashed potatoes) at one another across the dinner table. Some people might want to disconnect from those around them and instead turn to electronics as a coping mechanism. The problem is, you’ll miss out on the meaningful moments as well. Togetherness needs to be enjoyed to the fullest to get the most benefit, even during awkward or difficult times. Try to avoid using your phone as a tool of avoidance, no matter how fun your favorite mobile game may be, or how much you want to check out the latest holiday products. It’s okay to pick up your device during the morning football game or while the family is in cooking mode. You can still enjoy the feeling of being connected anywhere, anytime. How about just not around the Thanksgiving dinner table? Just like your brain, put your phone into holiday mode and unlock it when the time is right. Take advantage of apps that encourage family friendly fun, like games of charades or trivia. If your family or friends are onboard for a dessert Draw Something or Pictionary match, go for it! Tap into mobile trends for Black Friday. The morning before the big event is a great time to scour for Black Friday deals and discounts and check out product reviews for your new toaster. At the dinner table - not so much. Instead, you can use your newfound Black Friday knowledge about those steals to regale and impress your family with what they can purchase. If a family of phones can find a balance for being connected on mobile during the holidays, so can you. Like this cartoon? Explore The Tales of Adventure to create ads that might just come to life!